Once again, this isn’t one of those family recipes handed down from my mother to me to Ashley, but they are so much fun and so Christmasy, when I found the recipe and tried them the first time, they became an instant favorite Christmas tradition! I just can’t convince Ben not to try and eat them before the topping is put on. He always picks one up and complains there’s no flavor as he eats half of it and throws the other part away. Well, there’s a reason there’s no flavor to them because the main flavors are in the topping and you AREN’T supposed to eat them without it! But I guess scolding the husband is part of the yearly tradition of making them! 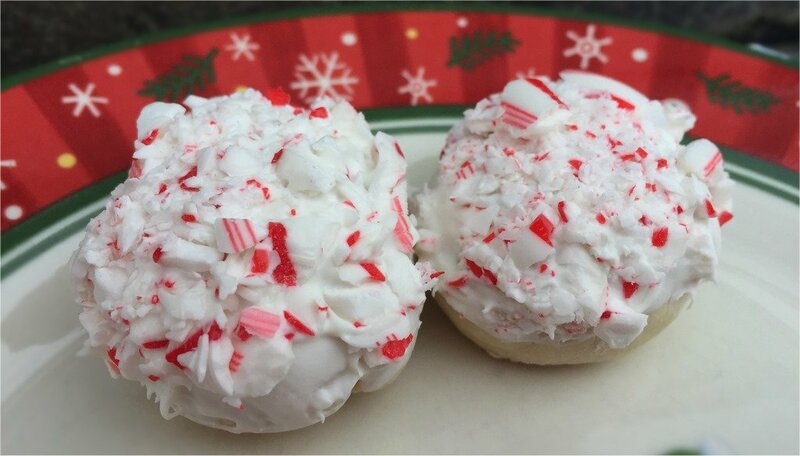 Another part of the fun of making these cookies is crushing the candy canes to make the topping. Ashley has always enjoyed this part…it’s a good way to take your frustrations out! We always use a small kitchen hammer. The best way to smash them is in a plastic freezer bag on top of a soft dish towel; NOT directly on your counter top, especially if you have granite countertops. It would not be a pretty sight. (We also discovered this year that if you buy the mini candy canes that are individually wrapped and smash them inside the wrapping, it’s easier, because you can just cut the wrapper open and dump the pieces into a bowl. So give them a try. The worst part is you have to refrigerate the dough for some 3-4 hours after you make it before you can bake them. Don’t try to bake them without doing that, because you’ll have a mess, and won’t be able to shape them properly. Recipes have directions for a reason! And don’t worry about completing them in one day. If you leave the dough in the refrigerator for a day or up to two, it will still be fine. Just not any longer. Refrigerate in bowl (covered with plastic wrap) 3-4 hours or until dough is easy to handle. Preheat oven to 350 degrees. Roll dough in 1” balls (dough may be a bit hard at first so you may have to use a spoon to get the right amount, and if it’s a bit bigger, it’s ok), Place 2” apart on ungreased cookie sheet. Bake 18-20 minutes or until lightly browned. Remove immediately to wire racks and cool thoroughly. At least 1-2 packages of candy melts (sold in craft stores or specialty cake stores). Two packages are best because you can use two different colors for the topping – I like pink and red; white isn’t as festive. In microwave safe bowl, melt about 1/3 c of the candy melts (1 color at a time) per package directions, stirring til smooth. Dip the top of each cooled cookie into candy coating, and then immediately into the crushed candy canes. Put them back on the wire racks to allow candy melts to harden and store in covered containers. They will keep for several weeks if necessary. They are yummy and make 5-6 dozen! Enjoy!